For the duration of daylight and night, see Daytime and Night. The North Pole, also known as the Geographic North Pole or Terrestrial North Pole, is the point in the Northern Hemisphere where Earth's axis of rotation meets its surface. This point is distinct from Earth's North Magnetic Pole. The South Pole is the other point where Earth's axis of rotation intersects its surface, in Antarctica. Earth rotates once in about 24 hours with respect to the Sun, but once every 23 hours, 56 minutes, and 4 seconds with respect to other, distant, stars (see below). Earth's rotation is slowing slightly with time; thus, a day was shorter in the past. This is due to the tidal effects the Moon has on Earth's rotation. Atomic clocks show that a modern day is longer by about 1.7 milliseconds than a century ago, slowly increasing the rate at which UTC is adjusted by leap seconds. Analysis of historical astronomical records shows a slowing trend of about 2.3 milliseconds per century since the 8th century BCE. Among the ancient Greeks, several of the Pythagorean school believed in the rotation of Earth rather than the apparent diurnal rotation of the heavens. Perhaps the first was Philolaus (470–385 BCE), though his system was complicated, including a counter-earth rotating daily about a central fire. A more conventional picture was that supported by Hicetas, Heraclides and Ecphantus in the fourth century BCE who assumed that Earth rotated but did not suggest that Earth revolved about the Sun. In the third century BCE, Aristarchus of Samos suggested the Sun's central place. However, Aristotle in the fourth century BCE criticized the ideas of Philolaus as being based on theory rather than observation. He established the idea of a sphere of fixed stars that rotated about Earth. This was accepted by most of those who came after, in particular Claudius Ptolemy (2nd century CE), who thought Earth would be devastated by gales if it rotated. In 499 CE, the Indian astronomer Aryabhata wrote that the spherical Earth rotates about its axis daily, and that the apparent movement of the stars is a relative motion caused by the rotation of Earth. He provided the following analogy: "Just as a man in a boat going in one direction sees the stationary things on the bank as moving in the opposite direction, in the same way to a man at Lanka the fixed stars appear to be going westward." In the 10th century, some Muslim astronomers accepted that Earth rotates around its axis. According to al-Biruni, Abu Sa'id al-Sijzi (d. circa 1020) invented an astrolabe called al-zūraqī based on the idea believed by some of his contemporaries "that the motion we see is due to the Earth's movement and not to that of the sky." The prevalence of this view is further confirmed by a reference from the 13th century which states: "According to the geometers [or engineers] (muhandisīn), the Earth is in constant circular motion, and what appears to be the motion of the heavens is actually due to the motion of the Earth and not the stars." Treatises were written to discuss its possibility, either as refutations or expressing doubts about Ptolemy's arguments against it. At the Maragha and Samarkand observatories, Earth's rotation was discussed by Tusi (b. 1201) and Qushji (b. 1403); the arguments and evidence they used resemble those used by Copernicus. In medieval Europe, Thomas Aquinas accepted Aristotle's view and so, reluctantly, did John Buridan and Nicole Oresme in the fourteenth century. Not until Nicolaus Copernicus in 1543 adopted a heliocentric world system did the contemporary understanding of Earth's rotation begin to be established. Copernicus pointed out that if the movement of Earth is violent, then the movement of the stars must be very much more so. He acknowledged the contribution of the Pythagoreans and pointed to examples of relative motion. For Copernicus this was the first step in establishing the simpler pattern of planets circling a central Sun. Tycho Brahe, who produced accurate observations on which Kepler based his laws, used Copernicus's work as the basis of a system assuming a stationary Earth. In 1600, William Gilbert strongly supported Earth's rotation in his treatise on Earth's magnetism and thereby influenced many of his contemporaries. Those like Gilbert who did not openly support or reject the motion of Earth about the Sun are often called "semi-Copernicans". A century after Copernicus, Riccioli disputed the model of a rotating Earth due to the lack of then-observable eastward deflections in falling bodies; such deflections would later be called the Coriolis effect. However, the contributions of Kepler, Galileo and Newton gathered support for the theory of the rotation of Earth. Earth's rotation implies that the Equator bulges and the geographical poles are flattened. In his Principia, Newton predicted this flattening would occur in the ratio of 1:230, and pointed to the pendulum measurements taken by Richer in 1673 as corroboration of the change in gravity, but initial measurements of meridian lengths by Picard and Cassini at the end of the 17th century suggested the opposite. However, measurements by Maupertuis and the French Geodesic Mission in the 1730s established the oblateness of Earth, thus confirming the positions of both Newton and Copernicus. In Earth's rotating frame of reference, a freely moving body follows an apparent path that deviates from the one it would follow in a fixed frame of reference. Because of the Coriolis effect, falling bodies veer slightly eastward from the vertical plumb line below their point of release, and projectiles veer right in the Northern Hemisphere (and left in the Southern) from the direction in which they are shot. The Coriolis effect is mainly observable at a meteorological scale, where it is responsible for the opposite directions of cyclone rotation in the Northern and Southern hemispheres (anticlockwise and clockwise, respectively). Hooke, following a suggestion from Newton in 1679, tried unsuccessfully to verify the predicted eastward deviation of a body dropped from a height of 8.2 meters, but definitive results were obtained later, in the late 18th and early 19th century, by Giovanni Battista Guglielmini in Bologna, Johann Friedrich Benzenberg in Hamburg and Ferdinand Reich in Freiberg, using taller towers and carefully released weights. [n 1] A ball dropped from a height of 158.5 m departed by 27.4 mm from the vertical compared with a calculated value of 28.1 mm. The most celebrated test of Earth's rotation is the Foucault pendulum first built by physicist Léon Foucault in 1851, which consisted of a lead-filled brass sphere suspended 67 m from the top of the Panthéon in Paris. Because of Earth's rotation under the swinging pendulum, the pendulum's plane of oscillation appears to rotate at a rate depending on latitude. At the latitude of Paris the predicted and observed shift was about 11 degrees clockwise per hour. Foucault pendulums now swing in museums around the world. Earth's rotation period relative to the Sun (solar noon to solar noon) is its true solar day or apparent solar day. It depends on Earth's orbital motion and is thus affected by changes in the eccentricity and inclination of Earth's orbit. Both vary over thousands of years, so the annual variation of the true solar day also varies. Generally, it is longer than the mean solar day during two periods of the year and shorter during another two. [n 2] The true solar day tends to be longer near perihelion when the Sun apparently moves along the ecliptic through a greater angle than usual, taking about 10 seconds longer to do so. Conversely, it is about 10 seconds shorter near aphelion. 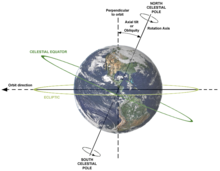 It is about 20 seconds longer near a solstice when the projection of the Sun's apparent motion along the ecliptic onto the celestial equator causes the Sun to move through a greater angle than usual. 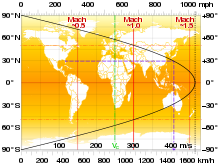 Conversely, near an equinox the projection onto the equator is shorter by about 20 seconds. Currently, the perihelion and solstice effects combine to lengthen the true solar day near 22 December by 30 mean solar seconds, but the solstice effect is partially cancelled by the aphelion effect near 19 June when it is only 13 seconds longer. The effects of the equinoxes shorten it near 26 March and 16 September by 18 seconds and 21 seconds, respectively. The apparent solar time is a measure of Earth's rotation and the difference between it and the mean solar time is known as the equation of time. On a prograde planet like Earth, the stellar day is shorter than the solar day. At time 1, the Sun and a certain distant star are both overhead. At time 2, the planet has rotated 360° and the distant star is overhead again but the Sun is not (1→2 = one stellar day). It is not until a little later, at time 3, that the Sun is overhead again (1→3 = one solar day). Earth's rotation period relative to the fixed stars, called its stellar day by the International Earth Rotation and Reference Systems Service (IERS), is 86,164.098 903 691 seconds of mean solar time (UT1) (23h 56m 4.098 903 691s, 0.997 269 663 237 16 mean solar days). [n 3] Earth's rotation period relative to the precessing mean vernal equinox, named sidereal day, is 86,164.090 530 832 88 seconds of mean solar time (UT1) (23h 56m 4.090 530 832 88s, 0.997 269 566 329 08 mean solar days). Thus, the sidereal day is shorter than the stellar day by about 8.4 ms. Plot of latitude vs tangential speed. The dashed line shows the Kennedy Space Center example. The dot-dash line denotes typical airliner cruise speed. The angular speed of Earth's rotation in inertial space is 7.2921150 ± 0.0000001×10^−5 radians per SI second. [n 4] Multiplying by (180°/π radians) × (86,400 seconds/day) yields 360.985 6°/day, indicating that Earth rotates more than 360° relative to the fixed stars in one solar day. Earth's movement along its nearly circular orbit while it is rotating once around its axis requires that Earth rotate slightly more than once relative to the fixed stars before the mean Sun can pass overhead again, even though it rotates only once (360°) relative to the mean Sun. [n 5] Multiplying the value in rad/s by Earth's equatorial radius of 6,378,137 m (WGS84 ellipsoid) (factors of 2π radians needed by both cancel) yields an equatorial speed of 465.10 metres per second (1,674.4 km/h). Some sources state that Earth's equatorial speed is slightly less, or 1,669.8 km/h. This is obtained by dividing Earth's equatorial circumference by 24 hours. However, the use of only one circumference unwittingly implies only one rotation in inertial space, so the corresponding time unit must be a sidereal hour. This is confirmed by multiplying by the number of sidereal days in one mean solar day, 1.002 737 909 350 795, which yields the equatorial speed in mean solar hours given above of 1,674.4 km/h. The tangential speed of Earth's rotation at a point on Earth can be approximated by multiplying the speed at the equator by the cosine of the latitude. For example, the Kennedy Space Center is located at latitude 28.59° N, which yields a speed of: cos 28.59° × 1674.4 km/h = 1470.2 km/h. Earth's rotation axis moves with respect to the fixed stars (inertial space); the components of this motion are precession and nutation. It also moves with respect to Earth's crust; this is called polar motion. Precession is a rotation of Earth's rotation axis, caused primarily by external torques from the gravity of the Sun, Moon and other bodies. The polar motion is primarily due to free core nutation and the Chandler wobble. is the orbital radius of the Moon. This process gradually increased the length of day to its current value and resulted in the Moon being tidally locked with Earth. This gradual rotational deceleration is empirically documented with estimates of day lengths obtained from observations of tidal rhythmites and stromatolites; a compilation of these measurements found the length of day to increase steadily from about 21 hours at 600Myr ago to the current 24 hour value. By counting the microscopic lamina that form at higher tides, tidal frequencies (and thus day lengths) can be estimated, much like counting tree rings, though these estimates can be increasingly unreliable at older ages. A simulated history of Earth's day length, depicting a resonant-stabilizing event throughout the Precambrian era. The current rate of tidal deceleration is anomalously high, implying Earth's rotational velocity must have decreased more slowly in the past. Empirical data tentatively shows a sharp increase in rotational deceleration about 600Myr ago. Some models suggest that Earth maintained a constant day length of 21 hours throughout much of the Precambrian. This day length corresponds to the semidiurnal resonant period of the thermally-driven atmospheric tide; at this day length, the decelerative lunar torque could have been canceled by an accelerative torque from the atmospheric tide, resulting in no net torque and a constant rotational period. This stabilizing effect could have been broken by a sudden change in global temperature. Recent computational simulations support this hypothesis and suggest the Marinoan or Sturtian glaciations broke this stable configuration about 600Myr ago, citing the resemblance of simulated results and existing paleorotational data. Additionally, some large-scale events, such as the 2004 Indian Ocean earthquake, have caused the length of a day to shorten by 3 microseconds by affecting Earth's moment of inertia. Post-glacial rebound, ongoing since the last Ice age, is also changing the distribution of Earth's mass thus affecting the moment of inertia of Earth and, by the conservation of angular momentum, Earth's rotation period. The length of the day can also be influenced by manmade structures. For example, NASA scientists calculated the water stored in the Three Gorges Dam has increased the length of Earth's day by 0.06 microseconds due to the shift in mass. The primary monitoring of Earth's rotation is performed with very-long-baseline interferometry coordinated with the Global Positioning System, satellite laser ranging, and other satellite techniques. This provides an absolute reference for the determination of universal time, precession, and nutation. There are recorded observations of solar and lunar eclipses by Babylonian and Chinese astronomers beginning in the 8th century BCE, as well as from the medieval Islamic world and elsewhere. These observations can be used to determine changes in Earth's rotation over the last 27 centuries, since the length of the day is a critical parameter in the calculation of the place and time of eclipses. A change in day length of milliseconds per century shows up as a change of hours and thousands of kilometers in eclipse observations. The ancient data are consistent with a shorter day, meaning Earth was turning faster throughout the past. Earth's original rotation was a vestige of the original angular momentum of the cloud of dust, rocks, and gas that coalesced to form the Solar System. This primordial cloud was composed of hydrogen and helium produced in the Big Bang, as well as heavier elements ejected by supernovas. As this interstellar dust is heterogeneous, any asymmetry during gravitational accretion resulted in the angular momentum of the eventual planet. However, if the giant-impact hypothesis for the origin of the Moon is correct, this primordial rotation rate would have been reset by the Theia impact 4.5 billion years ago. Regardless of the speed and tilt of Earth's rotation before the impact, it would have experienced a day some five hours long after the impact. Tidal effects would then have slowed this rate to its modern value. ^ It can be established that SI seconds apply to this value by following the citation in "USEFUL CONSTANTS" to E. Groten "Parameters of Common Relevance of Astronomy, Geodesy, and Geodynamics" which states units are SI units, except for an instance not relevant to this value. ^ Dennis D. McCarthy; Kenneth P. Seidelmann (18 September 2009). Time: From Earth Rotation to Atomic Physics. John Wiley & Sons. p. 232. ISBN 978-3-527-62795-0. ^ Stephenson, F. Richard (2003). "Historical eclipses and Earth's rotation". Astronomy & Geophysics. 44 (2). pp. 2.22–2.27. Bibcode:2003A&G....44b..22S. doi:10.1046/j.1468-4004.2003.44222.x. ^ Kim Plofker (2009). Mathematics in India. Princeton University Press. p. 71. ISBN 978-0-691-12067-6. ^ a b Young, M. J. L., ed. (2 November 2006). Religion, Learning and Science in the 'Abbasid Period. Cambridge University Press. p. 413. ISBN 9780521028875. ^ Nasr, Seyyed Hossein (1 January 1993). An Introduction to Islamic Cosmological Doctrines. SUNY Press. p. 135. ISBN 9781438414195. ^ Copernicus, Nicolas. On the Revolutions of the Heavenly Spheres. Book I, Chap 5–8. ^ Russell, John L. "Copernican System in Great Britain". In J. Dobrzycki (ed.). The Reception of Copernicus' Heliocentric Theory. p. 208. ^ Almagestum novum, chapter nine, cited in Graney, Christopher M. (2012). "126 arguments concerning the motion of the earth. GIOVANNI BATTISTA RICCIOLI in his 1651 ALMAGESTUM NOVUM". Journal for the History of Astronomy. volume 43, pages 215–226. arXiv:1103.2057. ^ Newton, Isaac (1846). Newton's Principia. Translated by A. Motte. p. 412. ^ Shank, J. B. (2008). The Newton Wars and the Beginning of the French Enlightenment. University of Chicago Press. pp. 324, 355. ISBN 9780226749471. ^ "Starry Spin-up". Retrieved 24 August 2015. ^ a b Jean Meeus; J. M. A. Danby (January 1997). Mathematical Astronomy Morsels. Willmann-Bell. pp. 345–346. ISBN 978-0-943396-51-4. ^ "Equation of time in red and true solar day in blue". Jgiesen.de. Retrieved 22 September 2018. ^ Ricci, Pierpaolo. "www.pierpaoloricci.it/dati/giorno solare vero VERSIONE EN". Pierpaoloricci.it. Retrieved 22 September 2018. ^ "INTERNATIONAL EARTH ROTATION AND REFERENCE SYSTEMS SERVICE : EARTH ORIENTATION PARAMETERS : EOP (IERS) 05 C04". Hpiers.obspm.fr. Retrieved 22 September 2018. ^ "Physical basis of leap seconds" (PDF). Iopscience.iop.org. Retrieved 22 September 2018. ^ "Prediction of Universal Time and LOD Variations" (PDF). Ien.it. Retrieved 22 September 2018. ^ a b c d "USEFUL CONSTANTS". Hpiers.obspm.fr. Retrieved 22 September 2018. ^ P. Kenneth Seidelmann, ed. (1992). Explanatory Supplement to the Astronomical Almanac. Mill Valley, California: University Science Books. p. 48. ISBN 978-0-935702-68-2. ^ IERS Excess of the duration of the day to 86,400s … since 1623 Archived 3 October 2008 at the Wayback Machine Graph at end. ^ "Excess to 86400s of the duration day, 1995-1997". Web.archive.org. 13 August 2007. Retrieved 22 September 2018. ^ Butterworth & Palmer. "Speed of the turning of the Earth". Ask an Astrophysicist. NASA Goddard Spaceflight Center. ^ a b Williams, George E. (1 February 2000). "Geological constraints on the Precambrian history of Earth's rotation and the Moon's orbit". Reviews of Geophysics. 38 (1): 37–59. Bibcode:2000RvGeo..38...37W. doi:10.1029/1999RG900016. ISSN 1944-9208. ^ a b Zahnle, K.; Walker, J. C. (1 January 1987). "A constant daylength during the Precambrian era?". Precambrian Research. 37 (2): 95–105. Bibcode:1987PreR...37...95Z. CiteSeerX 10.1.1.1020.8947. doi:10.1016/0301-9268(87)90073-8. ISSN 0301-9268. PMID 11542096. ^ Scrutton, C. T. (1 January 1978). "Periodic Growth Features in Fossil Organisms and the Length of the Day and Month". In Brosche, Professor Dr Peter; Sündermann, Professor Dr Jürgen (eds.). Tidal Friction and the Earth's Rotation. Springer Berlin Heidelberg. pp. 154–196. doi:10.1007/978-3-642-67097-8_12. ISBN 9783540090465. ^ Bartlett, Benjamin C.; Stevenson, David J. (1 January 2016). "Analysis of a Precambrian resonance-stabilized day length". Geophysical Research Letters. 43 (11): 5716–5724. arXiv:1502.01421. Bibcode:2016GeoRL..43.5716B. doi:10.1002/2016GL068912. ISSN 1944-8007. ^ Sumatran earthquake sped up Earth's rotation, Nature, 30 December 2004. ^ Wu, P.; W.R.Peltier (1984). "Pleistocene deglaciation and the earth's rotation: a new analysis". Geophysical Journal of the Royal Astronomical Society. 76 (3): 753–792. Bibcode:1984GeoJ...76..753W. doi:10.1111/j.1365-246X.1984.tb01920.x. ^ "NASA Details Earthquake Effects on the Earth". NASA/JPL. Retrieved 22 March 2019. ^ "Permanent monitoring". Hpiers.obspm.fr. Retrieved 22 September 2018. ^ Sid Perkins (6 December 2016). "Ancient eclipses show Earth's rotation is slowing". Science. doi:10.1126/science.aa10469 (inactive 5 March 2019). ^ FR Stephenson; LV Morrison; CY Hohonkerk (7 December 2016). "Measurement of the Earth's rotation: 720 BC to AD 2015". Proceedings of the Royal Society A. 472 (2196): 20160404. Bibcode:2016RSPSA.47260404S. doi:10.1098/rspa.2016.0404. PMC 5247521. PMID 28119545. ^ Stevenson, D. J. (1987). "Origin of the moon–The collision hypothesis". Annual Review of Earth and Planetary Sciences. 15 (1): 271–315. Bibcode:1987AREPS..15..271S. doi:10.1146/annurev.ea.15.050187.001415. If the Earth's rotation period is less than 24 hours, why don't our clocks fall out of sync with the Sun?